The Dynalite Single Floater front drag kit is purpose built for use on lightweight cars using spindle mount brakes on P&S / Anglia style spindles. The DLSF calipers and lightweight steel rotors combine to provide excellent static holding power for use as a staging brake or as a supplementary brake on vehicles using parachutes and rear brakes to provide the majority of the stopping power. Aluminum hats are provided to mount the rotors directly to the spindle mount wheels. A choice of solid or lightweight drilled rotors is offered to provide the lowest possible weight to the front axle. Mount brackets are included. DPS Front Drag kits incorporate the newest DynaPro caliper technology in this traditional style front brake kit. DPS kits are built for the common front spindles and aftermarket struts used on four-wheel disc brake drag cars that weigh in under 2,400 pounds. The billet DPS caliper is a fixed mount, two-piston design that mounts directly to the spindle with a bolt-on bracket. Forged billet, five lug hubs with direct mount lightweight steel rotors combine to provide consistent braking with an average weight savings of 35 pounds over stock drum or disc brakes. Kits include all new hardware, wheel bearings, and seals. FDL Front Drag kits are drag racing’s most popular front brake kits. FDL kits are available for the popular muscle car spindles and select aftermarket front struts used on four-wheel disc cars weighing up to 2,800 pounds, or rear drum brake equipped cars weighing up to 2,400 pounds. Forged billet FDL four piston calipers mount directly to the spindle with a bolt-on bracket. Forged billet, five lug hubs with direct mount steel rotors combine to provide an average weight savings of over 30 pounds compared to stock drum or disc brakes. Kits include all new hardware, wheel bearings, seals and extra length lug studs. FDL Front Drag Brake Kits with Hats are drag racing’s most popular front brake kits. FDL kits are available for the popular Import car spindles or front struts used on four-wheel disc cars weighing up to 2,800 pounds, or rear drum brake equipped cars weighing up to 2,400 pounds. Forged billet FDL four piston calipers mount directly to the spindle with a bolt-on bracket. Forged Hats with direct mount steel rotors combine to provide an average weight savings of over 30 pounds compared to stock drum or disc brakes. Kits include attachment hardware, brake pads, and instructions. DPR forged billet, radial mount four piston calipers are used in this select group of drag racing kits. The OE brakes on vehicles originally equipped with 16” or larger wheels generally do not fit inside the popular 15” drag wheels. Specially designed radial caliper mount brackets bolt directly to the OE caliper mount, and provide secure and accurate mounting for the DPR caliper. Kits with 3/8” steel rotors are recommended for four-wheel disc brake cars up to 2,800 pounds. Kits with .81” rotors should be used on cars over 2,800 pound cars, or lighter cars running extreme speeds desiring increased rotor durability. 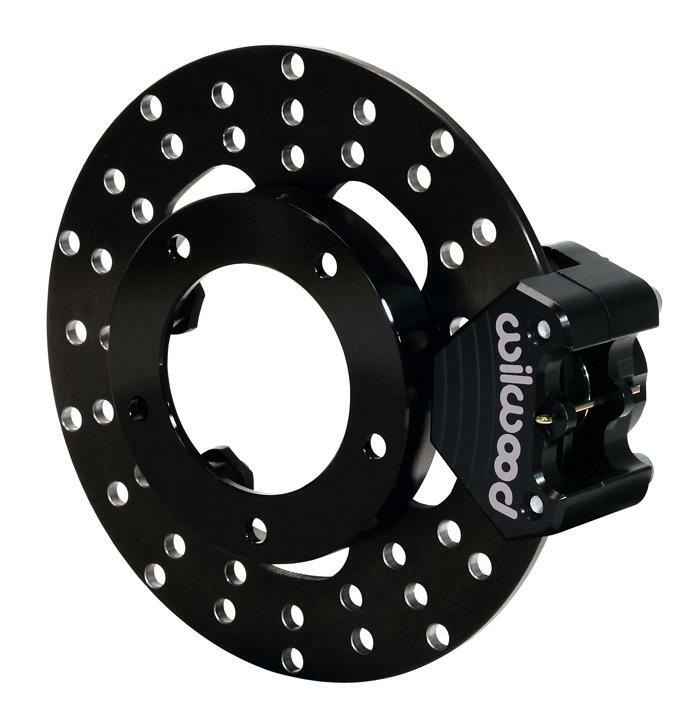 Wilwood’s new Billet Dynapro Lug Drive Dynamic Rotor Mount Brake Kits are especially beneficial to cars that rely heavily on the rear brakes for stopping and any other high speed, heavy weight cars that generate above average rear brake heat. The lug-drive rotor mounting system eliminates the rotor bolts and allows the rotors to move independently of the hats as they expand and contract through heat cycles. All thermally generated stress is removed from the rotor attachment points. The rotors stay flatter and run truer. Brake response and pedal feel remain consistent. Pad knock back and rotor drag are eliminated. The hats are no longer distorted by stresses generated by thermal expansion and shrinkage of the rotors. All problems associated with thermal distortion, including bolt hole alignment issues when trying to re-install new rotors on a previously used hat, are eliminated. Kits are available in Single and Dual caliper configurations.